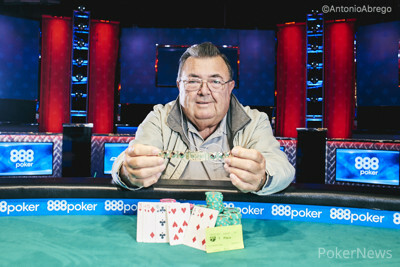 Ernest Bohn came into Event #40: $1,500 Seven Card Stud Hi-Lo 8 or Better, his fourth World Series of Poker tournament, with nary a recorded live cash to his name. He left it a WSOP champion with a gold bracelet and $173,228 in prize money after getting through a field of 595 players. The long, grueling days of tournament poker can be a grind on anyone. But, a 68-year-old relative tournament novice playing a 13-hour slog on Day 3, when tournament decisions are most pressure-packed and taxing on the mind? One could be forgive for expecting such a situation to take its toll, but Bohn said he felt right at home. "I'm not a good sleeper anyways," he said. "If I get two hours of sleep, three hours of sleep that's enough. So, I was wide awake." Indeed Bohn appeared to be the man with the advantage against Bill Kohler as the night wound deeper, with the two battling short-handed and then heads up for several hours. Sipping the occasional Scotch, Kohler kept things lively throughout much of the day with a relatively constant stream of chatter. However, by the night's end, even when he had surges into the lead during heads-up play, Kohler's table talk died down as it took all of his energy just to get the proper betting amounts out. The man from Cincinnati had come second in this very event in 2009. "He was starting to play a little loose," Bohn said. "I said, 'This is my tournament.' I picked up on it right away." However, Bohn didn't deviate much at all from his initial game plan. He came into Day 3 looking to play a solid game, and it was a plan he executed to perfection. He didn't seem inclined to do much stealing and seemed to have it almost every time he bet strongly, with his weakest holdings at showdown being mostly strong one-pair hands and one-way low hands. "I made up my mind," he said of his approach to Day 3. "I'm gonna play cautious, I'm not gonna chase, and I'm going to play the best hands possible. It worked." 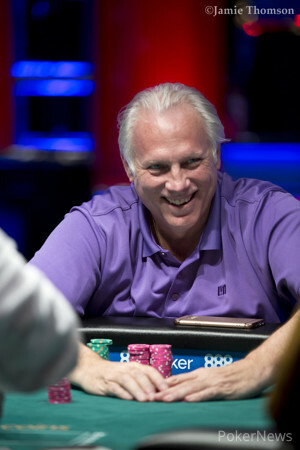 Most of Bohn's poker experience, he said, comes from playing in a $0.50/1 home game that runs every other Friday, with much of the action coming in stud and split-pot games. He also used to put in some hours at the tables in Atlantic City, once a haven for stud players, in years past. It turned out to be enough to conquer a final table that included multiple-bracelet winners Ted Forrest and Max Pescatori, as well as high stakes expert Justin Bonomo. While they battled and took each other out one by one, Bohn sat quietly, grinding and listening to his "good old rock 'n roll and country" to keep himself occupied and in line. 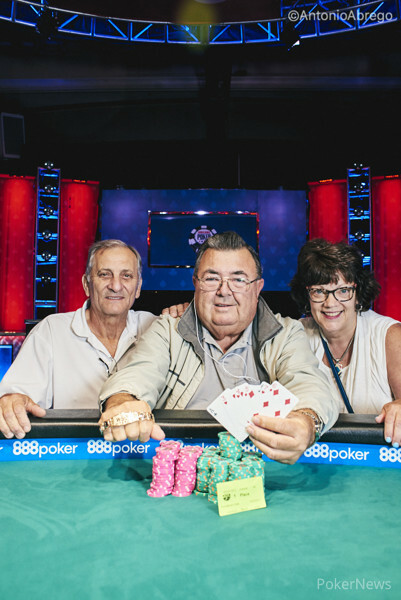 He took the lead into heads-up play, but despite the stacks being short, Bohn and Kohler sparred for two hours until the 68-year-old took command with a series of pots in the final level before they'd have bagged to come back for an unscheduled Day 4. When it was all over, Bohn let out an excited shout after showing hardly an ounce of emotion over the course of 13 hours. "We're both retired now, my wife and I," said the former harness racing trainer. "We've been together 46 years, and we like to travel. We're going to do a little sightseeing. I'm happy as all hell." Ernest Bohn completed with the and Bill Kohler called with the . Kohler called another bet on fourth, saying: "I think this might be it, Ernie." Bohn fired one more bet on fifth, covering Kohler's 105,000 remaining chips. Kohler nearly called but then paused and counted his chips. Then he finally called. Kohler received a meaningless on sixth but spiked a pair of tens on the river, turning up the . Bohn hit the on sixth and was guaranteed to take at least a half of the pot with his low. He looked at his last card after Kohler had exposed his full hand, knowing which cards would be sealing the victory. Bohn rolled over the for a straight and shouted "Yes!" in immediate joy. Bill Kohler repeated his result from 2009, adding another runner-up finish from $1,500 Stud Hi-Lo to his name. This time, Kohler's performance was rewarded with a $107,063 prize. Ernest Bohn didn't strike the killing blow, but he has Bill Kohler in awful shape with less than two big bets. The key hand came up with Bohn sporting high cards and then pairing queens on board, betting fourth, fifth, and sixth. Bohn did his signature dark check on the end. "Unbelievable," Kohler said after sweating out his last card. "Open-ended and I get a frickin' nine." He showed for a whiffed straight and low draw, and Bohn turned over for trips. Ernest Bohn barreled fourth, fifth and sixth streets before checking seventh in the dark. Kohler called the three bets and checked back on the river. He had three consecutive wheel cards on his board, but didn't qualify for low. Kohler showed eights and threes for two pair but Bohn topped that with his queens and jacks. Bohn is now getting closer to the finish line with Kohler playing under five big bets. Ernest Bohn bet fourth, fifth and sixth streets against Bill Kohler, who called down to the river. "Jacks," Kohler said after both checked. Bohn rolled over for kings. With the tenth level in the bag, the tournament staff gave players option to call it a day or play an extra level. Kohler let his opponent choose and Bohn agreed to carry on for one more hour. Bill Kohler completed with the and Ernest Bohn defended his . Fourth street saw Kohler bet again and Bohn stuck around. Fifth street turned out to be very interesting. Bohn was first to act and he checked. Kohler continued in barreling, but Bohn opted for a check-raise. Kohler said "I call," twice but he didn't know he was supposed to pay more. The dealer explained him the situation and Kohler changed his mind, trying to send his hole cards to the muck. The dealer and floor person informed Kohler that he was still obliged to pay the extra bet. Kohler then took his cards back and said: "Alright then, I'm going to play my cards face up." So the action continued through to sixth street where Kohler called Bohn's bet. Bohn, knowing six of Kohler's seven cards, fired on the river as well. Kohler finally gave up. Bohn showed him his two pair, jacks and deuces. That was the last hand before the break.